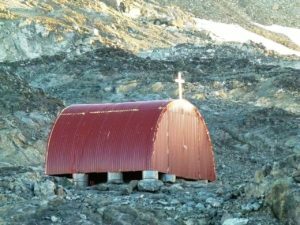 Church in Antarctica – W.A.P. 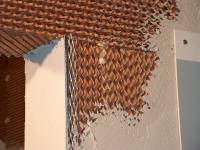 April 16th, marks the anniversary of the blessing and inauguration of the oratory of the Chapel at Base Marambio. 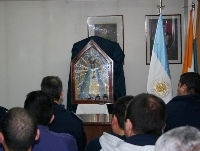 On April 16, 1996, a solemn ceremony was held at Marambio Base (WAP ARG-21), where the Military Bishop of the Argentine Republic at the Solemn Pontifical, proceeded to bless and inaugurate the Oratory of the Base, place under the invocation of the Blessed Virgin of Luján . 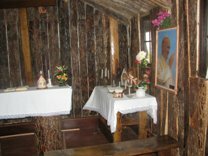 In this chapel on October 23, 2014, a wooden chest with a glass lid was discovered, containing a rosary and the skullcap that Pope Francis used, along with a parchment framed with the blessing of the Holy Father to the Antarctic, all this brought from the Vatican, when the President of the Marambio Foundation had an audience with His Holiness in the month of May 2014; act performed at Marambio Base, which is recorded in a document signed by the authorities present. 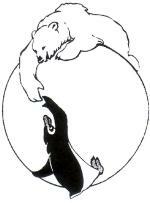 C oming across a social network, I found an interesting page, set by someone set foot in Antarctica and left a tangible sign of what they did! 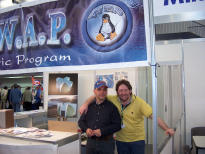 Here below is a piece of the a long and distinct period of history with a particular feature or characteristic; WAP have to be grateful to Mr. Patrick McCormick a veteran who spent a period of his youth in Antarctica and we are so happy to relive such great memories! 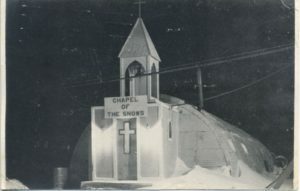 Patrick (pic aside) wrote: I wintered at McMurdo in 1956 and had a hand in building the “Our Lady of the Snows” Chapel. The following is an excerpt from my memoir describing its origin. The attached photo was taken in late December 1956. “There was one building that wasn’t exactly in the original plan. This is a genuine story and today, after more than 60 years, it revive here as a great example for everyone, certainly a source of pride made relive! TNX Patrick and Maureen McCormick … and Happy Birthday to this great old man rabble! Catholic chapel (named after Saint Francis of Assisi) was built in 1976 at the Argentine Esperanza Base. 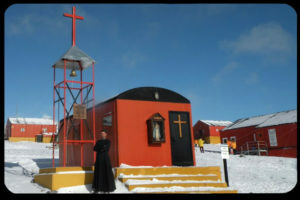 The southernmost Christian chapel (in fact, the southernmost place of worship of any religion) lies at the Argentine Belgrano II Base at Coats Land. 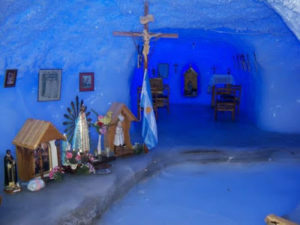 It is a permanent Catholic chapel made entirely of ice. (see https://en.wikipedia.org/wiki/Religion_in_Antarctica) Once again WAP is proud to be quoted on WikipediA! 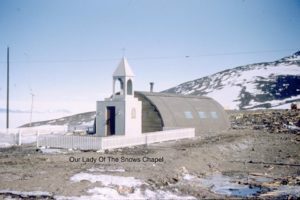 The white Chapel of the Snows, a 64-seat house of worship with a pretty, penguin-motif stained-glass window and an organ, is the third Chapel raised at McMurdo Station in Antarctica (the first two were destroyed by fire). The Erebus Chalice, which first traveled to Antarctica with Ross in 1841, m ay be the oldest Antarctic relic on the continent. Now, thanks to Francois F8DVD who found and Old postcard (dated 1964) and shared it; the front side of that card (pic above), shows the original chapel as it was at the time. 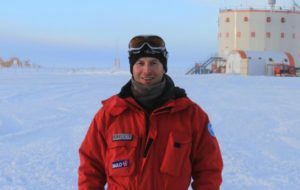 Daniele Karlicek (pic aside), of the Department of Mathematics and Geosciences at the University of Trieste (Italy), did winter over a couple of times at the Italian-French Base “Concordia-Dome C” (WAP MNB-Ø3) in Antarctica, involved in a paleoclimatic research campaign as part of the research activities carried out at the Isotopic Geochemistry Laboratory of the University of Trieste. 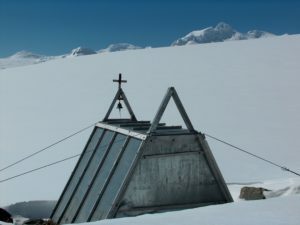 While he was working on the Antarctic Plateau, Daniele Karlicek left a comment about WAP proposal of buiding a chapel at the Italian Base MZS in Antarctica. 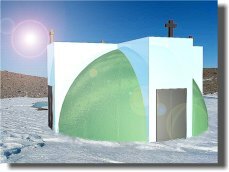 –Beautiful initiative, the one of building a Church in Antarctica!- he wrote, and add: –I did it myself, by reproducing with ice, the Dome Church of my town (Muggia, in the Province of Trieste) at Base Concordia “Dome C” during my overwintering stay- . Now Daniele has informed WAP that, time ago, an Australian Organization which has probably seen the “ice Church” published somewhere, did ask him to set a video on this matter. Lord will be certainly grateful of your job! 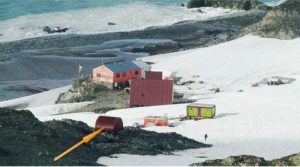 Bellingshausen Station (WAP RUS-Ø1) is a Russian (formerly Soviet) Antarctic Station at Collins Harbour, on King George Island of the South Shetland Islands. It was one of the first research stations founded by the Soviet Antarctic Expedition in 1968. 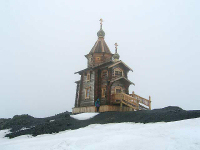 It is also the location of Trinity Church, the only permanently staffed Eastern Orthodox Church in Antarctica. 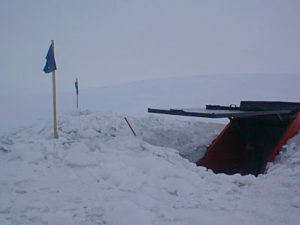 In the Argentinean Base Belgrano II (WAP ARG-Ø6), in the Land of Coats, there is a cave carved in the ice. It is the most southern place of religious worship on the planet, only 800 miles from the South Pole. The Catholic Chapel of “Our Lady of the Snows” serves the base throughout the year. Unlike the other temples that appear in this entrance, the Chapel of Our Lady of the Snows is dug in the ice instead of being a building to use. The chapel is accessed through a system of tunnels in the subsoil, built to facilitate the movement of the resident personnel and scientists that works at Belgrano II Research Station (WAP ARG-Ø6). Pedro Sarli LU1JHF, sent a link where (in spanish language) you can read the history of Base Belgrano I since the fist inauguration on 18 January 1955 and see lots of pics of this fantastic ice carved chapel. After an activity of 25 years, the old base General Belgrano (WAP ARG-Ø5) was inactivated. In order to continue the scientific programs and maintain the Argentine presence in the area, on February 5, 1979, the Belgrano II Base was founded as a replacement. 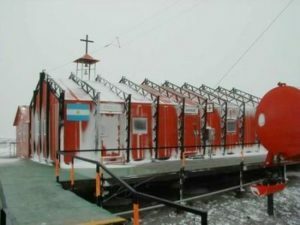 CAPILLA ANTÁRTICA (BASE BELGRANO II) SECTOR ARGENTINO DEL ANTÁRTICO ⛪HOGAR DE LA IGLESIA CATÓLICA EN EL EXTREMO MÁS AUSTRAL DEL MUNDO. HISTORIA LA BASE BELGRANO II. Pic here above shows the inside view of the ice carved Chapel; belows its the entrance! As our readers know, WAP is collecting information and pictures to document what important is, for the people in Antarctica, to have a place to pray Lord, an holy place to free one’s spirit and thank Lord for his magnificence. 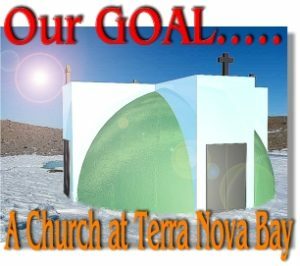 In the year 2003, WAP did propose to the italian authorities build a little Church at the Italian Base “Mario Zucchelli Station” at Terra Nova Bay… our proposal is still alive waiting the wall of bureaucracy to fall down! 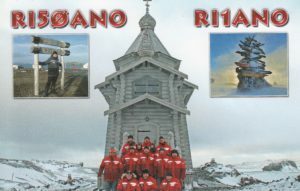 On one of the thirteen Argentine Research Stations in Antarctica, Esperanza Base (WAP ARG-Ø4), we find the Chapel of San Francisco de Asís. 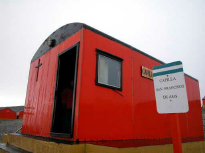 The Esperanza base is inhabited all year round by civilians and is considered by the Argentines, as the southernmost city of the country, although it is only a small village. Besides the church, the base also has a school, a museum, a bar, a casino and a hospital with permanent maternity service and where enough Argentines have come to the world. As a curiosity, to say that the first human born in the Antarctic continent, Emilio Marcos Palma, (born 7 January 1978) is an Argentine man known for being the first documented person born on the Icy Continent . Emilio Marcos Palma was baptized in the Chapel of San Francisco de Asís. 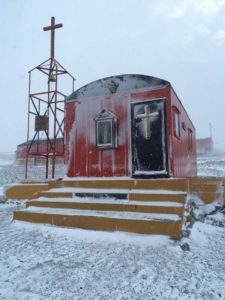 In addition to the Base Esperanza chapel, there are other Argentine Antarctic chapels permanently located in the operational bases. We’ll see them all shortly … follow us and enjoy Antarctica as much as we do! Humans have left their mark on the once virgin continent, Antarctica. In the research bases we can find a number of services that many less isolated places do not have. School, Post office, Hospital, bowling alley or ATM are some of the services we can find in the Icy Continent, and among all these buildings, Churches could not miss. Christianity was first established in Antarctica by Captain Aeneas Mackintosh who erected a cross on Wind Vane Hill in 1916. 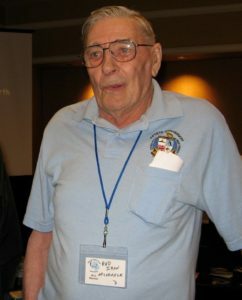 The first religious service was conducted in Antarctica in 1947 by William Menster with about 2,000 people from different Christian denominations in attendance. Research and whaling stations were erected in the large area of Antarctica in the early 1900s. 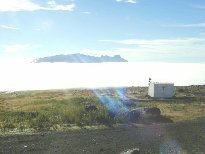 Since then, several scientists are attending the area especially during summer while a few people stay over during winter. The extended stay in the region can be stressful and challenging for researchers. 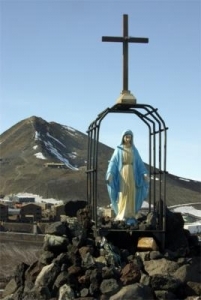 The Jesuit geophysicists have contributed to the growth of religion in the continent through Antarctica mission work. The religion in Antarctica dates back to the discovery of the continent in 18th century. However, Christianity was the first religious practice in the continent. 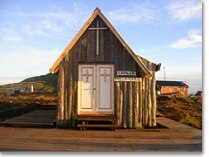 Antarctica has several places of worship, and has a growing demand for religious services and worship spaces in its territory. Despite the saying “below 40 degrees south there is no law; below 50 degrees south there is no God”, the exploration of the continent was closely related to religious activities and had numerous religious (for example, Jesuit geophysicists). Some of the first religious buildings are protected as historical monuments. 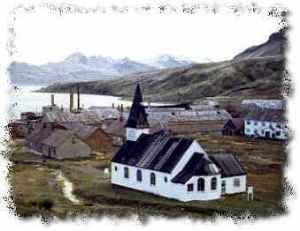 Shortly, WAP will start to publish history and picture of the Catholic Chapels that have been built in most of the Argentine Research Stations in Antarctica, even if the articles previously published on the old WAP website have been recovered by Floyd Larck KK3Q are already available through http://www.waponline.it/articles/church-archives/. Thanks to Marambio Foundation (http://www.marambio.aq/), thanks to Juan Manuel LU4CJM, Roberto LU3CQ, Horacio LU4DXU for providing descriptions and pics,. Is St. John Bosco truly the patron of Antarctica? Antarctica is undoubtedly a subject that is passionate, but it’s also a reality object of investments, of energies spent on studies and researches that for years are involving the whole world. For those who did not know, in 1975 the first Italian adventure in Antarctica did start by a private expedition carried out by a Milanese entrepreneur: Renato Cepparo. Italy did sign the Antarctic Treaty in 1981, a good 6 years after Cepparo’s expedition that built a scientific base in a place called Ezcurra Inlet in front of Admiralty Bay, South Shetland Islands in Antarctica. The literature is full of stories of Renato Cepparo (I1SR) who named his Base (picture aside) after the Italian explorer Giacomo Bove (WAP ITA-Ø2) and the fact that Italian government, fully disinterested in this tricolor flagging outpost, in 1976 gave it to Argentina which dismantled it by plundering the equipments that Cepparo had left in the Base Bove laboratory. Currently in that place, only the foundation on which the building was based is still visible. 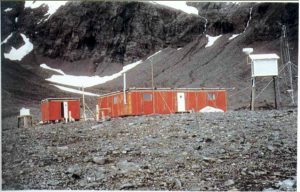 Poland, who have his research site (Arctowski Station) nearby, did call Italia Valley the place where the first Italian Base in Antarctica was built. 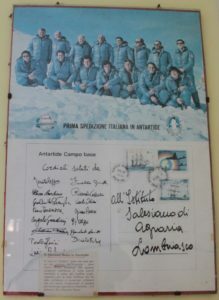 Now, going out the gymnasium of the Salesian Institute of Lombriasco (Turin, Italy) I did find, hanging on a wall, a postcard signed by the members of the Cepparo expedition, sent on December 25, 1975 from Antarctica to the Salesian Institute of Agriculture of Lombriasco; besides being a precious rarity, it’s a real scoop! Don Marco Casanova, Director of the Salesian School complex says: – Since my arrival in Lombriasco, I have always seen it there and sincerely, I have never deepened the link between the Salesians, Antarctica and the expedition of Renato Cepparo-. But there is a bit more: within the frame, a typescript was inserted in; it says: – St. John Bosco in Antarctica – On the subject, perhaps not everyone knows that Patron of the Antarctica – where last year seemed even to break the third world war because of the Anglo-Argentine conflict in the Falklands Islands, gave rise to numerous collections that are now appearing in more and more philatelic exhibitions – is the Salesian St. John Bosco . 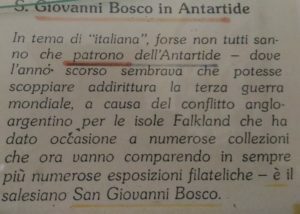 Therefore, the Italian Cepparo expedition in Antarctica took place in “December 1975-January 1976“, the Falklands war mentioned in the brief paragraph dates June 1982. It is likely that the typescript has been inserted inside the frame after 1982 and the question that arises now is: Is the Salesian St. John Bosco truly the Protector of Antarctica? It would be great, even if researches have been carried out, this news is not confirmed yet. The Chapel of the Snows, a non-denominational place of worship at NSF’s McMurdo Station, Antarctica, overlooks McMurdo Sound and the Royal Society mountain range. The current chapel, dedicated in 1989, features stained glass related to the Antarctic Continent; the Erebus Chalice, a William IV silver gilt chalice carried aboard HMS Erebus by Sir James Clark Ross on his Antarctic voyage during the period 1839-43; and memorabilia from the U.S. Navy‘s involvement in Operation Deep Freeze, the precursor to the NSF-managed U.S. Antarctic Program. The chapel’s altar comes from St. Saviour’s Chapel in Lyttelton, New Zealand, where Robert Falcon Scott worshiped prior to embarking on his Terra Nova Expedition. 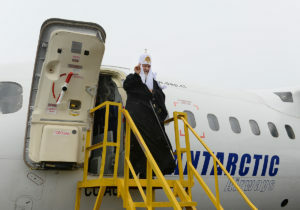 The head of the largest of the world’s Eastern Orthodox churches, Patriarch Kirill, has become the first Orthodox leader to visit Antarctica. 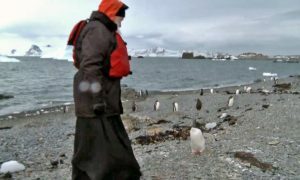 A week after meeting Pope Francis to smooth over centuries of tensions with the Roman Catholic Church, the Russian Orthodox Church’s Patriarch Kirill has reached out to another historically non-Orthodox congregation: penguins. 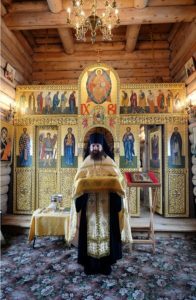 The Patriarch, who heads the largest of the world’s various eastern Orthodox churches, arrived at Russia’s Bellingshausen research station on King George Island, just off the coast of Antarctica, on Febr. 18, 2016. 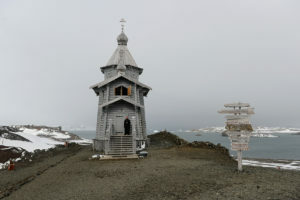 Patriarch Kirill of Moscow and all Russia prayed at the Trinity Church at the Russian Antarctic Station Bellingshausen on the island of Waterloo (aka King George Island). -You are here on the top of the planet … When I sanctified the water in Antarctica today, I thought about the whole globe below us, and prayed for God’s creation. Praying in this temple for relatives and all who works here in Antarctica, for their Countries and the whole world– said the Patriarch. In the last century, the Pontiffs have crossed the boundaries and the Oceans to bring the blessing of God to all peoples, but none have thought of going to Antarctica, a place at the end of the world as Pope Francis says to come from ! Perhaps this possibility could be a goal to him … if he wants it. The blessing of a vast Earth larger than Europe, occupied by hundreds of scientific Stations and thousands of people engaged in research, needs the blessing of a Church witnessing to those latitudes the love of God and of the Blessed Mother, His Most Holy Mother. The above message has been delivered by WAP, 4 years ago, to Pope Francis, after having sent the same one to Pope Benedict XVI few years before. That was given among the WAP proposal to build a Catholic Churh at the Italian Mario Zucchelli Station following the idea launched in the year 2004. When does Italy break the fear and do something like that? “When we send polar explorers to the South Pole we don’t ask about their confession, but every person can have a wish to be alone, to pray. Why don’t we build a church?” said Director of the National Ukrainian Antarctic Scientific Center, Valery Litvinov . 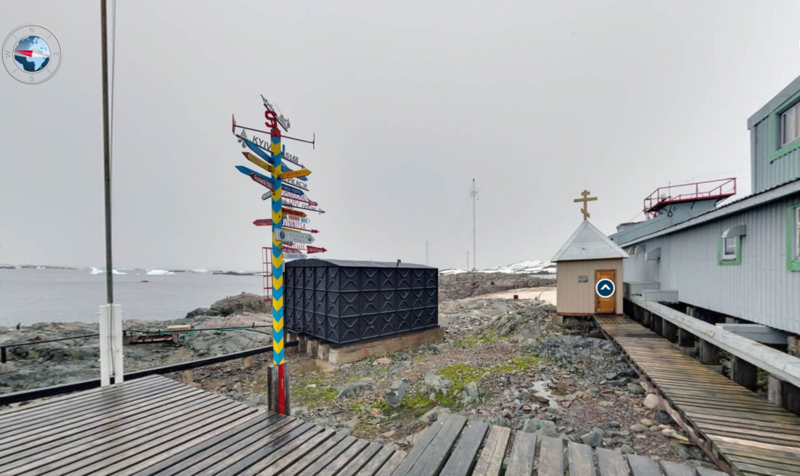 The St. Volodymyr Chapel, named after Vladimir the Great, is a Ukrainian Orthodox chapel located in the Ukrainian Antarctic Station of Vernadsky Research Base. 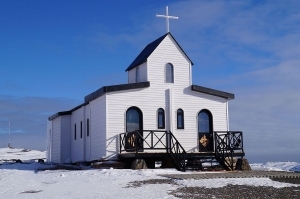 It is not the first Orthodox church on the ice continent: Russian carpenters built a 15-meter Orthodox church from Siberian cedar in 2004 that is dedicated to the Holy Trinity. “When you pray there you get unspeakable impressions. 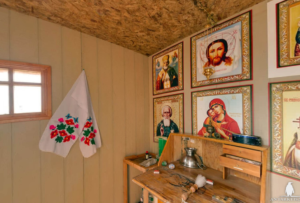 It is zero altitude, but you have such a feeling that the church almost flies above Earth,” said Archbishop Augustine of Lvov and Galicia who did consecrate the Ukrainian chapel. The chapel is small but its work is excellent. 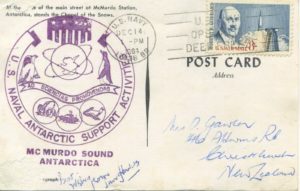 It has been sent to Antarctica while a new group of polar explorers was there. The building and installation of the chapel has been paid by philanthropists. The church is located on Galindez Island at the site of the Ukrainian research Base. It was built in 2011 and it’s the latest addition to the base buildings. 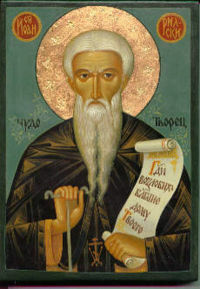 The Orthodox presence in Antarctica arises as parts of various expeditions from major Orthodox Christian Nations to the continent as there is not permanent population in Antarctica. The chapel, was named after patron of the Bulgarians, St.Ivan Ritski. It was built in the year 2003 with the assistance of the Bulgarian Antarctic scientific team. The foundation stones of the chapel were laid down on December 9, 2001, at that time, the base employs a total of between 12 and 15 people, geologists, biologists, doctors, meteorologists, botanists and others . A Spanish ship transported the parts that were used to build the chapel and it was completed on 2003. The chapel features include a bell, a cross, and icons of St. Ivan Rilski, and Jesus Christ the Bridegroom. 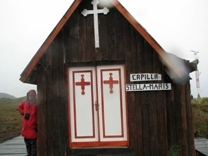 The Christian chapel is located on the Livingston Island’s Bulgarian Base of St. Kliment Ohridski. Recently (year 2012) a new building (see picture aside) was erected on a small slope; it gives the impression to protect the Base from above.